The Iowa Hawkeyes open the Big Ten tournament in Chicago Thursday and will take on the winner of the game between Nebraska and Penn State. The Hawkeyes take a six game winning streak into the tournament. “We are not changing very much, we’ll watch film, we’ll practice hard, we won’t practice long, this time of year we don’t. 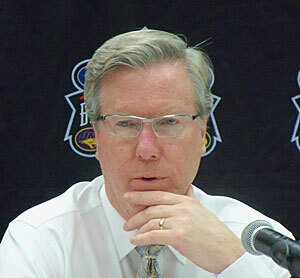 And try to stay locked in,” Iowa coach Fran McCaffery says. The Hawks are the fifth seed in the tournament. “It’s an opportunity to do something special, everybody recognizes that…the important thing is to stay together and remember what enabled us to be successful in the first place and not get out of character,” McCaffery says. The Hawkeyes have found success with a variety of defense the past couple of weeks. McCaffery says they want to be good in all defenses, but the big thing is to rebound and not give up second shots.